Being a geek at heart (and having the t-shirt to prove the fact), the reports that Microsoft Surface devices were now available for pre-order moved me to investigate the situation, especially when Henrik Walther (of msexchange.org fame, now holding a blue badge as a Microsoft employee) reported that he had preordered a Surface on the Microsoft UK Store. 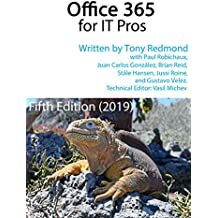 Henrik pointed me to the right page to order a 64GB Surface RT (the version running “normal” x64 software isn’t available yet). However, any attempt to access the link provoked some confusion and then annoyance as the good people who program Microsoft’s Store site have inserted code to redirect any IP address coming in from Ireland to an absolutely useless page (for my purposes). Cue frustration. Consulting the web turned up the fact that the countries on the list for for preorder are Australia, Canada, China, France, Germany, Hong Kong, the United Kingdom and the United States. No mention of Ireland here, which is surprising given the vast amount of Microsoft profits earned in Ireland due to its intellectual property being held by Irish-registered companies (something that irritates the U.S. IRS no end) and the fact that some engineering is done in Microsoft Ireland’s HQ about a mile from my house. 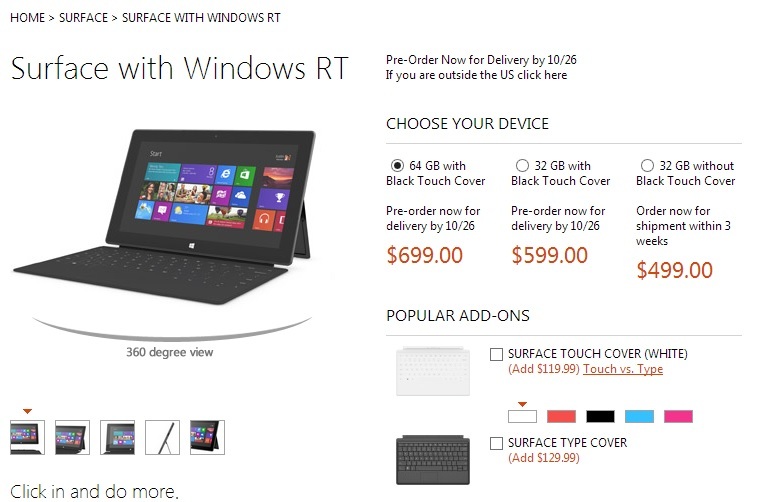 Interestingly, the people who run the Microsoft Store in the U.S. don’t block Irish visitors, perhaps because they think we’d never be interested in buying from a U.S. site (clearly they’ve not learned from Amazon.com), and presented a page offering a range of Surface options. Nice as it is to be able to see what the device costs, I’m not sure that I would spend $699 for a 64GB Wi-Fi device and then have to pay $129 for the Type cover (the version that has a complete keyboard) plus whatever tax is payable when the Irish customs detect the parcel arriving by post (probably 23% plus an administration fee). $699 seems expensive for a device that hasn’t yet proved itself in the market, even accounting for the fact that Home and Student Office 2013 (Preview) is installed. It would be more compelling if Microsoft had been able to produce a version of Outlook to include in the RT version. Windows 8 includes a Mail application that is OK but not as powerful as Outlook. On the accessory front, $129 seems like a lot for a Type cover when compared to some of the add-on keyboards that are available for the iPad. No doubt others will disagree in the rush to be the first kid on the block to own a Surface. Update: Once I reached London, I was able to preorder a Surface. 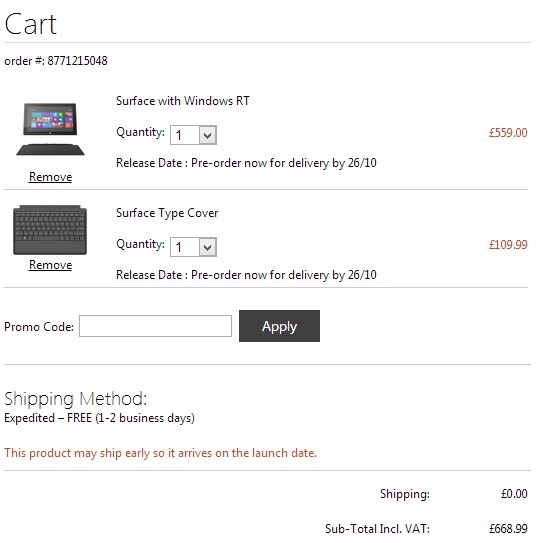 However, £668.99 for a 64GB RT with a Surface Type Cover (approximately €836 or $1,076 according to OANDA) seems a tad rich for what the device delivers. By comparison, the US site offers the same configuration for $828.99 plus whatever tax is charged depending on the state you live in, probably around $895 in most places or $181 cheaper than the UK. Microsoft will probably claim that the difference is entirely due to the much larger sales tax (VAT) charged in the UK (20%), but the cost makes me think that I shall wait! This entry was posted in Technology and tagged Ireland, Microsoft Surface RT. Bookmark the permalink. Try, if you have a US VPN, to go to the UK site. It will ‘think’ you are in the US (because your IP address will be in the US via the VPN) and will allow you through as far as the payment processing page.